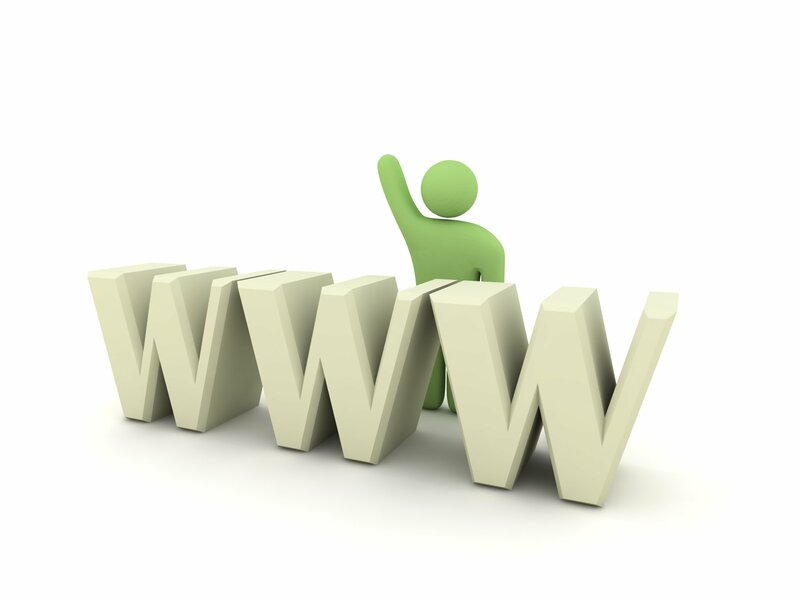 One of the most useful features of a multiuser virtual world platform like Jibe is the fact that it can be accessed from a web browser. Just click on a URL and you are instantly in a Jibe world. But Jibe doesn’t just live on the web. It also communicates with the web. Let’s learn how to easily make Jibe cause new content to load on your webpage! Today we’re going to learn how to define an area in a Jibe world that will cause a new webpage to load in an iframe whenever an avatar enters the area. We’ll also set it up so a different webpage loads whenever an avatar leaves the area. And just for fun, we’ll include a nice little audio cue that will play to let people know when something new has been loaded in the iframe. 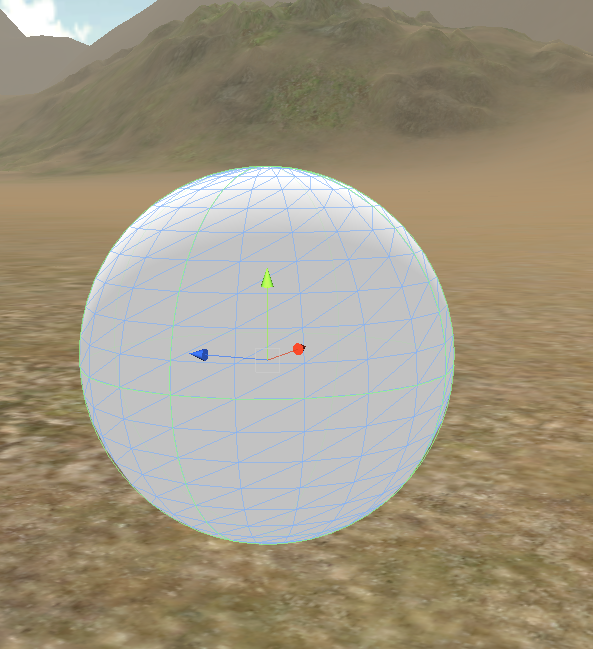 Fire up your Unity editor and create a GameObject sphere. How to create a GameObject sphere in your scene. Your new sphere sitting in your scene. 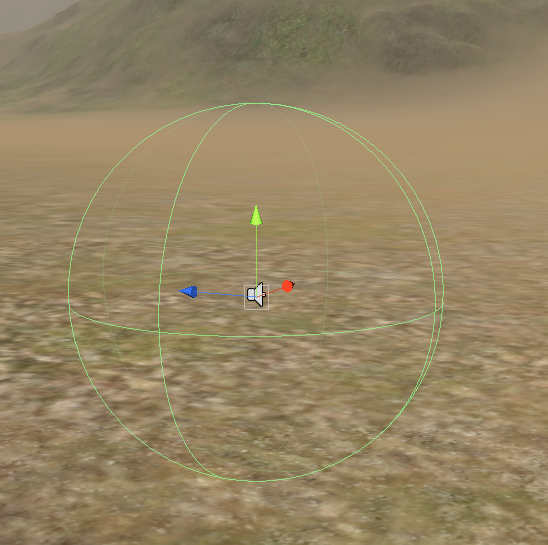 Go into the Inspector window view of your sphere and make sure Is Trigger is enabled. This will make the sphere a non-colliding object (so avatars can walk through it) and cause the sphere to send a trigger event whenever any avatar walks in or out of it. You’ll find a C# script called DetectAvatarWeb in your Project window. It’s included in the Jibe distribution package. Open this file and edit it. You don’t want to make changes to this script, since it is part of the Jibe package and may be updated in a new distribution. So we’re going to create a new script based on DetectAvatarWeb. 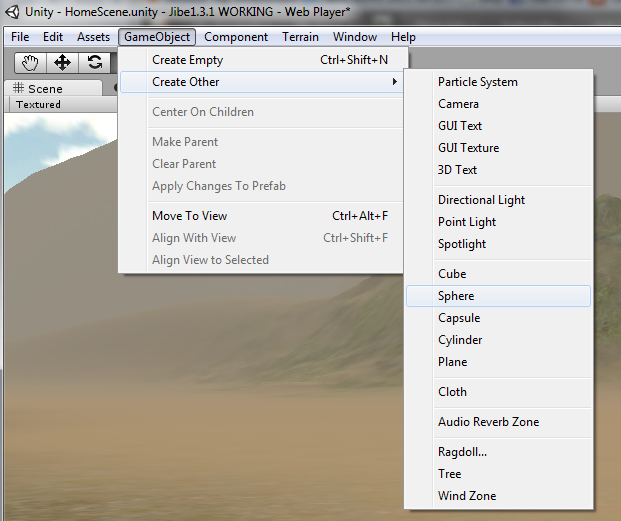 Go into the Unity editor and create a new C# script. Name this script DetectAvatarWeb2. Edit the script and paste the follow code into it. Save your modified DetectAvatarWeb2 script. Then drag a copy of it from your Project window into your sphere object. Your sphere after adding the DetectAvatarWeb2 script. There are 3 variables you’ll need to specify in the Inspector window. Here’s a nice little bleep sound on Freesound that you can download and use for free. It’s a .wav file, so I recommend you open it in Audacity and export it as an .ogg file to compress it. 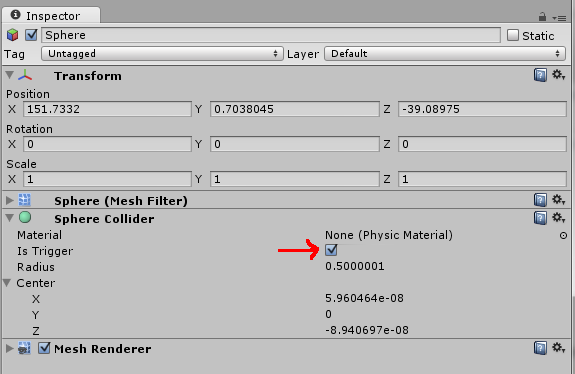 Drag the .ogg file into your Project window in the Unity editor, then drag it from your Project window into the sphere (a copy of it must be sitting in your sphere object). 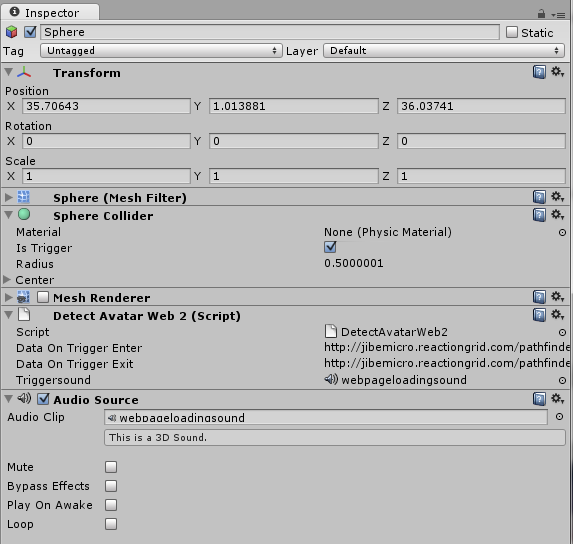 Then drag the .ogg file again from your Project window into the Triggersound field in the Inspector window. Notice in the above pic that I’ve also unchecked the MeshRenderer part of the sphere settings. This will make the sphere invisible. Sphere with MeshRenderer option turned off. You’ve now got everything set up in your Jibe world to send different URLs to a webpage based on two different trigger events (enter and exit). Now it’s time to edit your webpage to properly receive the data being sent from Jibe. Add the code highlighted here. Next, add an iframe to your webpage. The URLs being sent from Jibe will be loading in this iframe. An example of an iframe added to your Jibe webpage. In this example iframe, you’ll see that I’ve added a default URL in the src. That’s so the iframe isn’t empty when people first load your page. That’s it. Congratulations, you’re done! There are many powerful applications for this kind of interactivity. Imagine creating an educational Jibe world where different web-based content is automatically loaded whenever students approach different learning stations. Contextually relevant information can be triggered at any time. The possibilities are endless. You can see this all in action by visiting my own Jibe world. Oho! The left iframe of my webpage has changed! Here’s another example I created. In this one, your avatar walks up to a 3d model of HIV and it automatically opens up Wikipedia’s information on the virus. Visit my Jibe Demo World to try it yourself. To learn more about Jibe and meet other people sharing ideas and questions, be sure to check out our Jibe-Unity3d Google Group. UPDATE 2/29/2012: Rather than opening up a webpage in an iframe, some folks have asked how you could open the URL in a completely new webpage. Just to let you know I have a new SL url blog address – please could you add it to your blogroll! 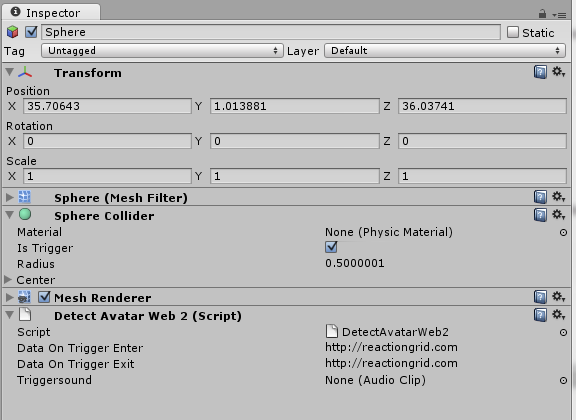 Hi John – I’m trying this in Unity (not Jibe) and I get hung up with the first DetectAvatarWeb2 script. 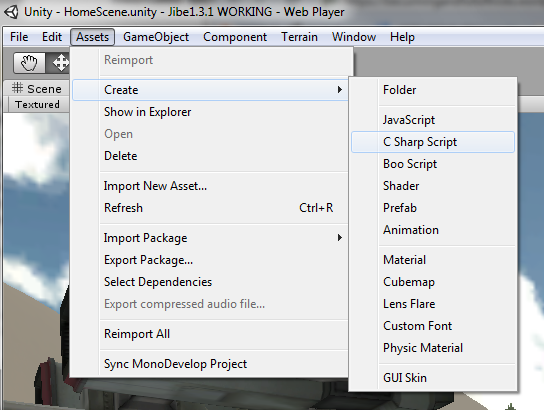 It will not compile in Unity 3.4.
and any reference to those variables later on. Also, it does not show them in the inspector. I tried replacing them with other strings (not URLs) to test but that didn’t help. I got past the problem by re-typing the quotation marks in the whole script in Monodevelop. Go figure. I’ll probably be back with my next mystery! Success with the whole process. Learned a lot. Thanks and welcome back from Peru! Excellent, and thank you. 🙂 Good to be back.